Contra is a run and gun game that originally hit arcades in 1987 before being ported to the NES and Famicom a year later. It supports 1 or 2 players simultaneously and you play the role of Bill and Lance who must stop the Red Falcon Organization from taking over the world. Your trusty Pea Shooter is always available but you can pick up a number of other weapons such as Laser, Fireball and Spread Gun. The latter is the preferred weapon as you can spray bullets all over the screen - it's definitely a bit overpowering but you'll miss it when you don't have it! At the time it was quite a novelty to be able to fire in eight different directions and it certainly helps out when enemies swarm you from all angles. You'll feel in total control of your character and although it has one-hit deaths the game is rarely cheap. The first level takes place in a horizontally scrolling stage with exploding bridges and several types of enemy turrets. It features different paths and you can even jump in the water without dying. Konami didn't stick with this format though and decided to throw in lots of variety. Stage 2 has a pseudo 3D look where you control the action from behind your character and move forward, almost like a maze shooter. It took me ages to figure out what to do but essentially if you duck most things can't touch you and you can pop up and attack when the turrets stop firing. Stage 3 is a vertically scrolling level with falling rocks, moving platforms and scenic waterfalls in the background. It's a shame it's the only stage of its kind as it forces you to change your strategy to account for the different multi-directional enemy placement. You'll then have to battle through a Snow Field, an Energy Zone and a Hangar before finally reaching the Alien's Lair. The bosses are epic in scale and look seriously intimidating next to your tiny character sprite! 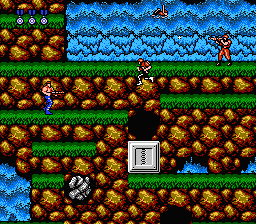 The smooth controls, impressive level design and variety are key to what makes Contra such an amazing game. The addition of co-op play is a huge plus for an NES title and Konami should be applauded for making a game that is practically flawless in all areas. Random trivia: Although many people associate the 30-life Konami Code with this game it was actually first used in the 1986 NES shooter Gradius.